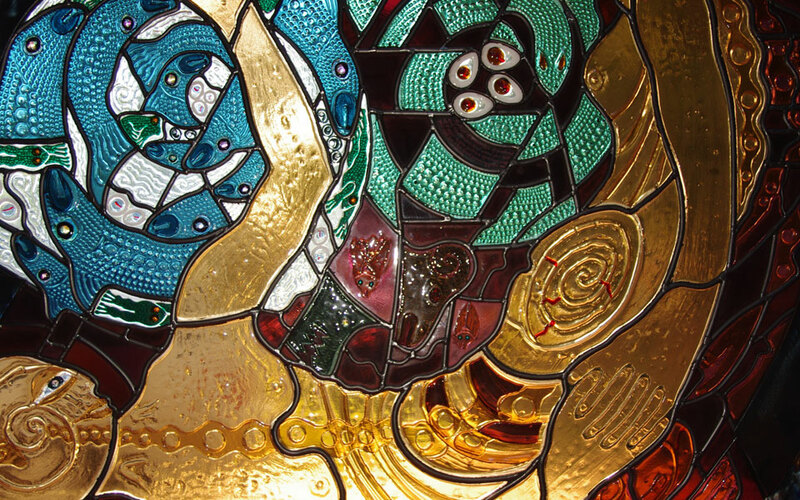 David Wright is one of the world’s leading glass artists. This website is a journey through a selection of his work spanning 40 years. 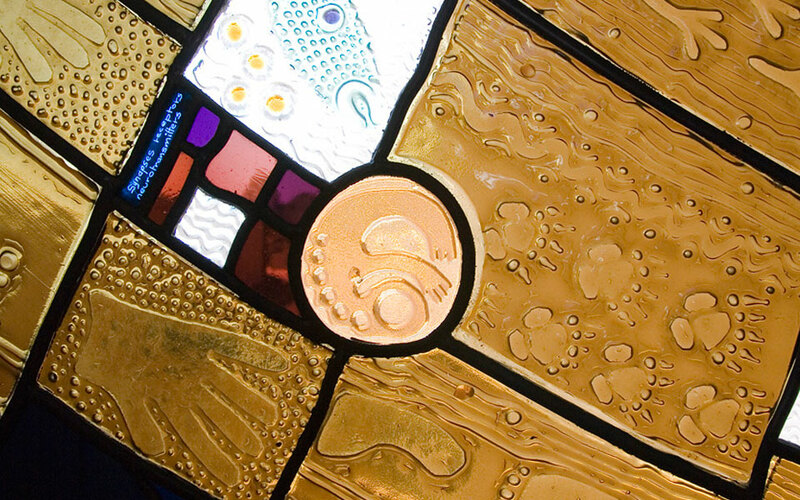 Since graduating in Architecture in the early 1970s David Wright has gained an international reputation for his unique style and glassworking techniques, whereby the glass is layered and moulded in the kiln, giving a rich colour and texture to his work. He has taught and lectured throughout Australia and overseas. David’s past commissions include work for the New Parliament House, Canberra and one of Australia’s largest ecclesiastical commissions, the Creation wall in the heritage St James, King St Sydney, commissioned as a bi-centennial project and a combined Hindu-Christian Worship Centre in Fiji. Major projects include 22 innovative windows for Temple Beth Israel Synagogue in Melbourne and a commission for St Peter’s Cathedral, Adelaide celebrating women’s ministry. Recent work for Caulfield Grammar School involves major windows for the Wheelers Hill campus and 12 innovative panels for the chapel of St Paul in Caulfield. 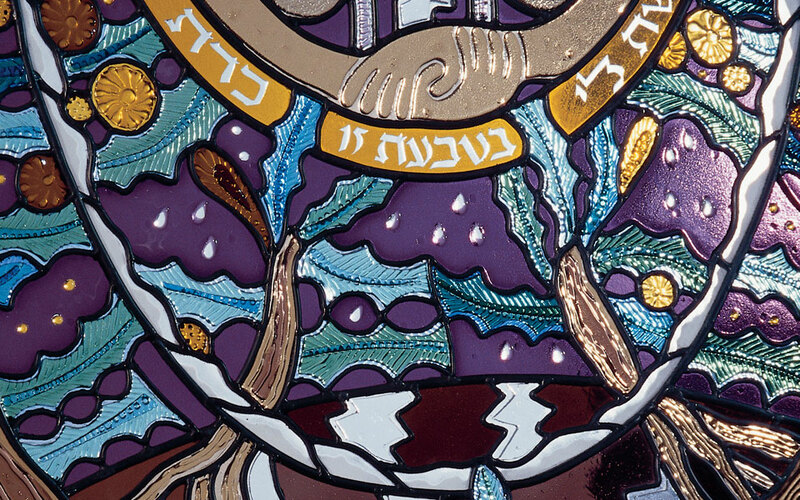 'Journeying' is a dominant metaphor in Judaism, and the Temple Beth Israel windows are designed to be portable, carried as precious fragments on the Jewish journey through life. The interlocking journeys are represented: the creation of the world, the story of the people of Israel, and the moulding of the individual through introspective 'Days of Awe; and the forming of relationships with God and with the rest of God's creation. The use of glass and metal express the interplay of light and darkness, knowledge and ignorance, love and hatred. We are made in God’s image in that we are creative beings. It will never be enough that we have gifts of skill and intelligence but we must continually pursue a sense of ‘rightness’ through the symbolic and the spiritual. It is our creativity and spirituality that give cleverness direction, make the scientifically 'true' seem 'right'. The more clever we become, the harder we must work at our creativity and spirituality so that we are not alienated by our own technology. Turtle Island is situated in Fiji's Yasawa Island group. The construction of a worship space on the island has been the realization of a long held dream for Richard Evanson and his staff. 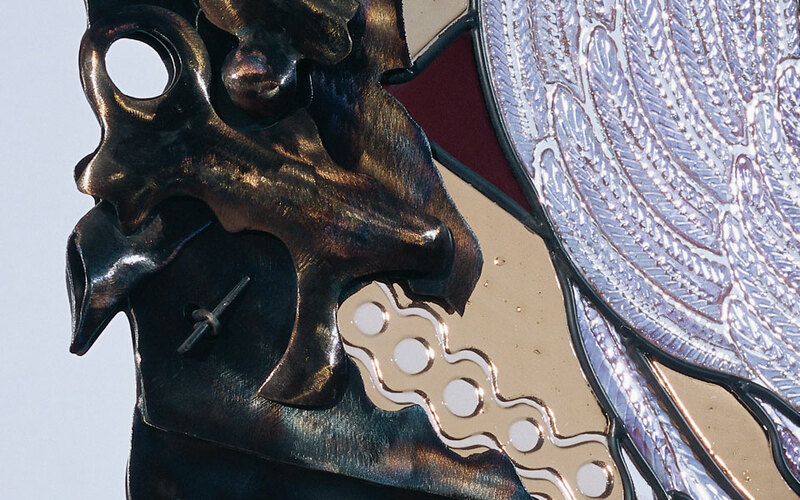 The designs for the windows for the new worship space weave together a number of strands of story and belief, just as the island itself represents the coming to. 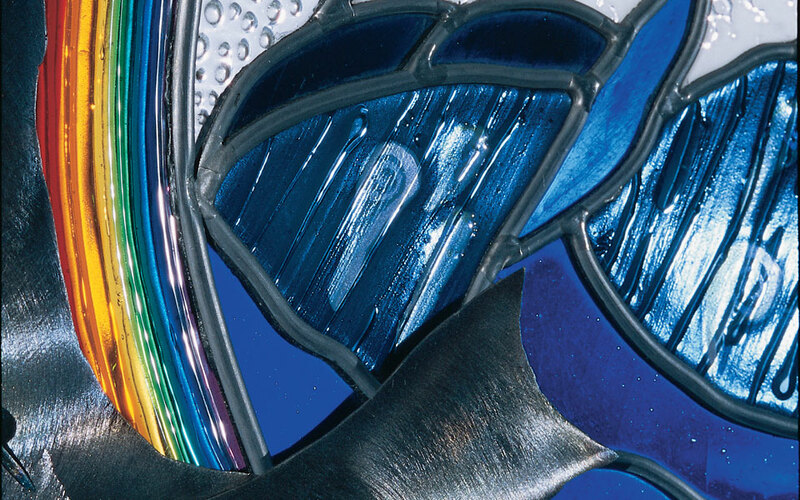 For the past 40 years Australian artist David Wright has produced hundreds of high quality art glass windows for Australian homes and sacred spaces, including significant national churches, school and hospital chapels, and a major synagogue. Wright's work has a significant place in contemporary Australian art, and, more specifically, a most significant place in contemporary Australian religious art. David's sense of Australia and its predominant religion, Christianity, is born of, and nurtured by, many influences. His childhood contained regular church attendance; his schooling the presence of resident artists Ron Miller and John Brack; his holidays the beach, rockpools and surf of the fishing town of Flinders; his time at this University the study of Architecture; as an adult, his marriage and relationship with Sue, an Anglican priest, and amongst a plethora of other influences, long painting trips in the Australian desert, oft repeated, either with other artists or with members of his family. These have produced an acute sense of the Australian landscape, its colour and form, its ancient history and its threat wrapped in the romance of this notion of the 'outback'. 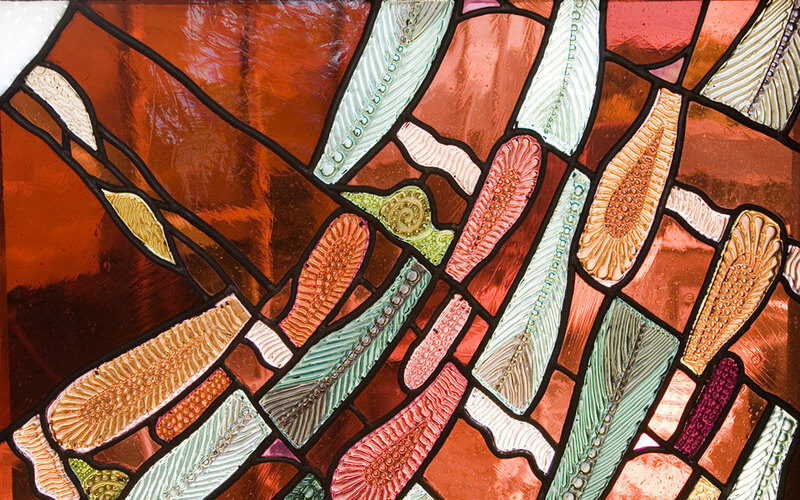 David Wright was born in Melbourne in 1948, and since his graduation from Melbourne University in 1972, has worked predominantly with kiln-formed flat and slumped glass. Highlights of his career include the beautifully feminine 54 square metre Mary Magdalene or Ministry of Women window for St. Peter's Anglican Cathedral, Adelaide; two windows for the Australia's Parliament House, Canberra; a suite of 20 large windows for Temple Beth Israel Synagogue, St. Kilda, Melbourne, the home of Australia's largest Jewish community ; the complex yet sublime series of windows for a Hindu-Christian Marriage Chapel on Turtle Island, Fiji, and the monumental 90 square metre interior windows of the Chapel of the Holy Spirit, in Sydney's oldest church, St. James' Anglican Church, King Street. Wright's work is installed in 13 churches in the states of Victoria and New South Wales; 8 school chapels in Victoria and Tasmania; 7 hospitals and numerous government and corporate commissions. Such works are rarely single pieces, usually consisting of two to eight windows. 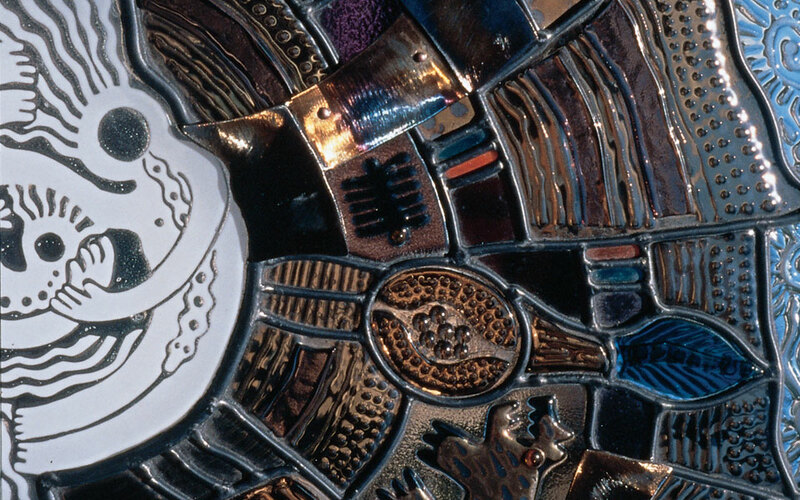 Wright's art is held in the collections of the National Gallery of Australia, the National Gallery of Victoria, the National Glass Collection and over a hundred works are held by numerous prominent Australian and overseas collectors. Exhibitions of his glass have included Deutscher Gallery, Distelfink Gallery, 101 Collins St. and the Craft Centre, in Melbourne; the Australian National Glass Biennial, Canberra, as well as The Pilchuck Glass School, USA, Europe and the Museum of Modern Art, Tokyo, Japan. A large number of publications include his work. Of particular note the single volumes Stained Glass in Australia by Jenny Zimmer; Lee, Seddon, and Stephens', Stained Glass, and most recently in Anderson, J. (ed.) Crossing Cultures: Conflict, Migration and Convergence. The Proceedings of the 32nd International Congress in the History of Art, The Miegunyah Press, 2009. 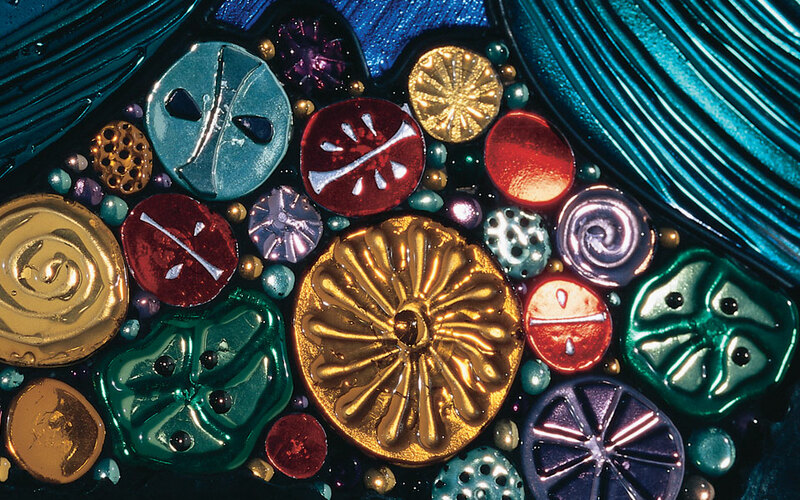 His work appears in multiple journals including the Australian publications Craft Arts, Craft Victoria, Craft Australia, and Architecture Australia; and internationally, in the American Glass Studio and in the German Neus Glas. David has taught glass-making at the Caulfield Institute of Technology, now Monash University, and at the Pilchuck Glass School, in Washington State, USA. 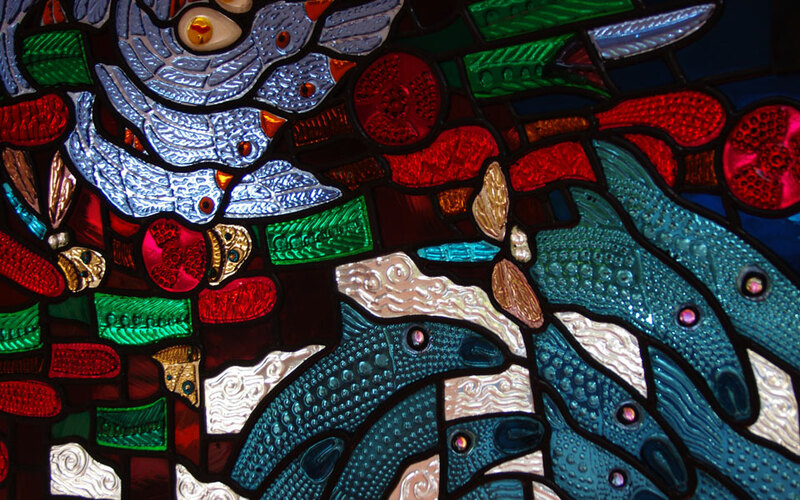 He is the recipient of grants from the Australia Council, has been a Board Member of the Craft Centre at the Meat Market, Melbourne, and President of Ausglas, the Australian Association of Glass Artists. The Chapel of St Mary at Wheelers Hill Campus was built in 2005 and dedicated by Bishop John Wilson in 2006. Its prominent location on the Campus and its elevated outlook to the Dandenong Ranges, has the Chapel affectionately known by the school community as 'the Chapel in the Sky.' 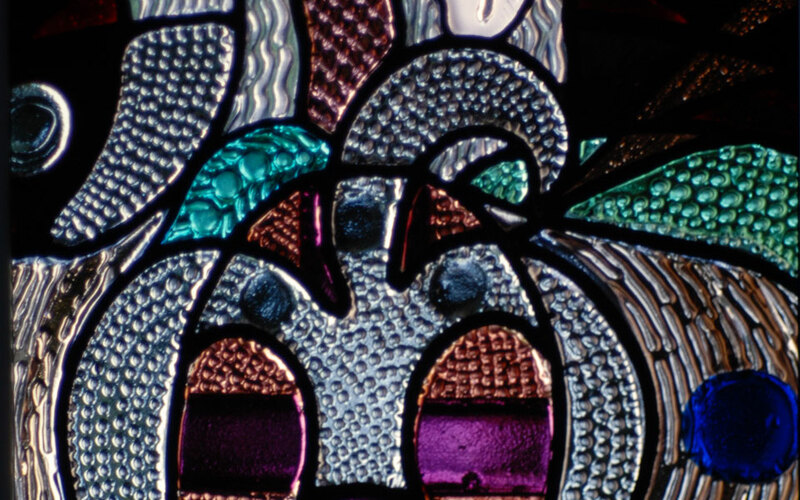 The two stained glass windows were commissioned by the School as part of the original design of the Chapel and were designed and created by David Wright. The Caulfield Campus Chapel was built in 1983 and extensively refurbished, extended and then re-dedicated as the Chapel ofSt Paul in 2006. 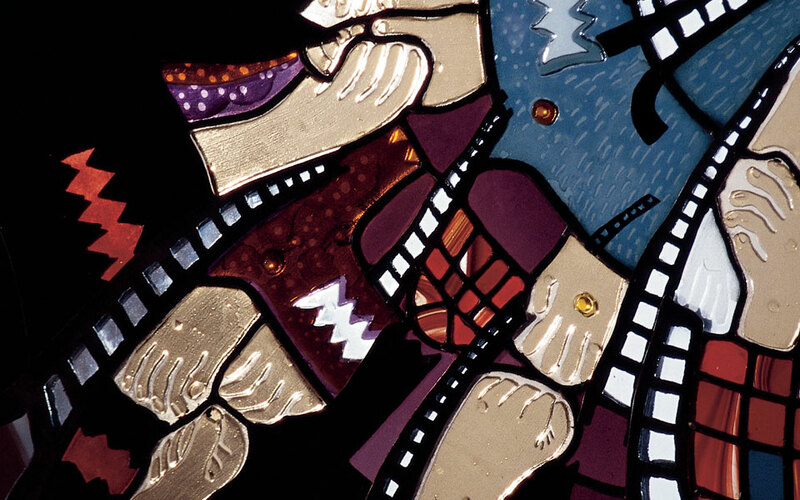 David Wright designed stained glass windows that would hang in the Chapel windows and would complement the windows in the Chapel of St Mary. The two Chapels have been designed to be beautiful spacesthat encourage those who gather in them to reflect and contemplate. The windows have been purposefully createdto deepen and enrich the experience of Chapel for our students and to enable God's presence to be felt by all who enter these sacred spaces. As we scientifically know more about the world and can intervene more in the processes of illness and ageing, we need to surrender old views of who we are and create new visions of who we are and who we might become. This is our creativity. Along with stumbling journey of discovery, our spirituality proves flashes of light, beacons pointing the way, the Flames of the Spirit. Cabrini is a community where the skill and the cleverness are matched by love, compassion, creativity and the Spirit. We are made in God's image in that we are creative beings. It will never be enough that we have gifts of skill and intelligence but we must continually pursue a sense of 'rightness' through the symbolic and the spiritual. It is our creativity and spirituality that give cleverness direction, make the scientifically 'true' seem 'right'. The more clever we become, the harder we must work at our creativity and spirituality so that we are not alienated by our own technology. God is represented by a single point at the centre of creation.The Spirit of God moves breath-like over the void, bringing light from darkness and meaning from chaos. Spiralling from God, all things and possibilities are created. Darkness separates each layer just as night divides the days. The waters above are separated from the waters below; the dry land appears then the earth is covered with plants, flowers, fruit and seeds. The heavens are stretched around the earth. The creatures of the water and air appear and then all the creatures that creep and crawl on the earth. Humankind is created in the image of God. We are given intelligence to wonder at the complexity of creation and to unravel the mystical beauty of the natural laws that thread the universe. We are exhorted to take care of God's creation. It isnot enough to have knowledge and skill. It is both our joy and our burden that we must seek meaning in our lives and determine the rightness of our actions. At Christ's crucifixion the curtain of the temple is torn from topto bottom. God-time "kairos" is superimposed on the more measurable "chronos". This is the new creation and we areinvited to enter God's space in intimate relationship. Christ's sacrifice proves His love for us and exemplifies that we must love one another. Christ says, "I am the light" and offers to be our companion and guide through life's journey. We must choose how we act between light and darkness, good and evil, creation and destruction. The empty tomb, stone rolled aside, reveals the unfolding shroud. We are surrounded by the promise of renewal in our lives, the chrysalis from which emerges the beautiful moth, the layer of dead decaying leaves which is the foundation for new growth of the seed and its shoot. The cross becomes a flowering tree and Christ's death and resurrection help us overcome fear of death. The mystery of the Eucharist promises us continuing renewal. 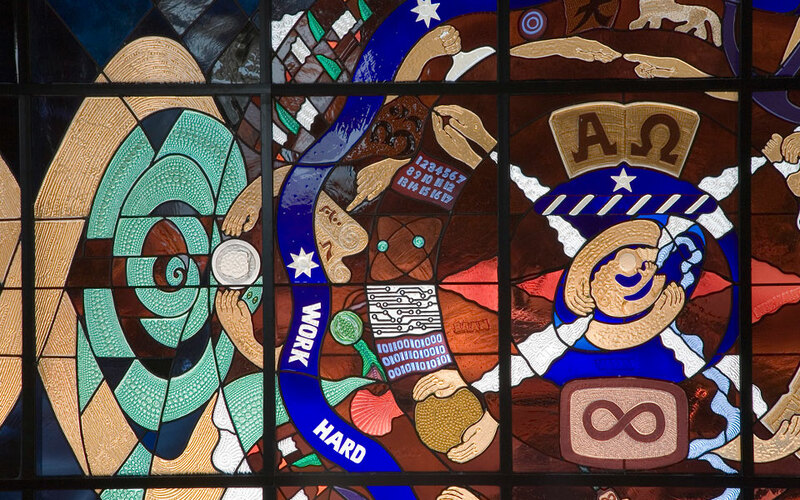 The Memorial Hall window is about humanity's relationship with creation, expressed through our various actions and beliefs. 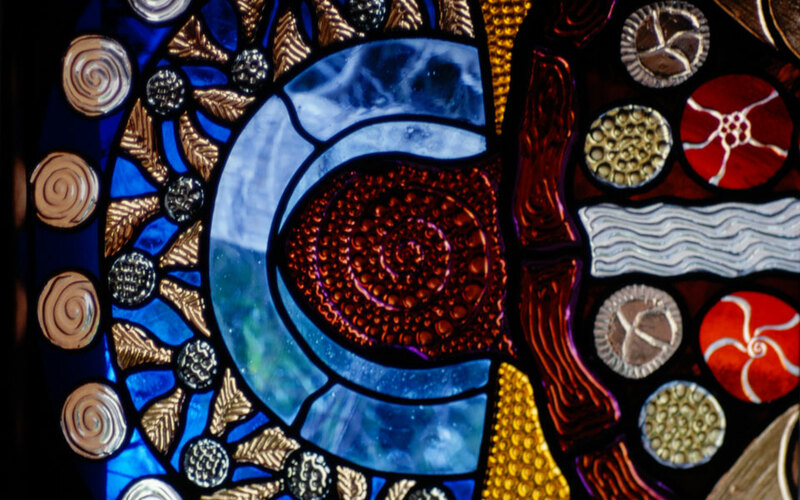 The window is about our relationship with each other expressed through community with particular emphasis on the community that is Caulfield Grammar School. All the great faiths are about treating each other properly and the school underpins learning with an emphasis on love and respect, service and justice. The embryonic figure at the centre of the design is our self. We pass from innocence at birth to wisdom through learning, moving from what Jung terms the ego to self-realisation. Being human, we are social beings and most importantly we learn from each other on the constant spiritual journey towards discovering who we are. As our communities expand like ripples in a pool, our relationships with each other and all of creation become more interdependent and complex. The design expresses the community that is the school by borrowing from the crest, the belt of knowledge and the seven cardinal virtues of charity, faith, hope, temperance, prudence, fortitude and justice, symbolised by hands holding, respectively,a child, a chalice, an anchor, a sword, a mirror and serpent, the earth and, finally, scales. Other aspects of the school's activitiesare shown including music, sport, literature, mathematics, science, service, creativity, prayer, technology and communication. Within the wider community of all of us here on earth, referenceis made to some of the varied relationships with God and creation. In its outward and inward spiralling nature, the design suggests a labyrinth in which the purpose is not to get lost, asin a maze, but to make the journey of life, to encounter, learnand rejoice in the variety and complexity of God's creation. To the left of the design is depicted the Tree of Knowledge andto the right is the Tree of Life. Each has its roots in the earth and the four rivers flow from the roots to nourish the earth, the water flowing like a spiritual element in the landscape. The other elements of air, fire and earth are given their aboriginal names. The interlocking spiral that forms each tree represents thedouble helix of life and the creative and destructive powers. At the foot of the Tree of Knowledge lie the coiled serpent and the fruit with its seed taking root in the fertile earth. The serpent sheds its skin, reminding us of the constant creative renewal that we must bring to bear to find meaning in our life. The fruit and the serpent remind us that, with God's gift to us of intelligence and free will, we must make moral and ethical decisions about the use of our knowledge. Bees in the branches are symbolic of the industry required to gain understanding: work hard that you may rest content. The Tree of Life is guarded by an angel with a burning sword.We are not immortal but we can gain eternal life through Christ's sacrifice, symbolised by the coiled crown of thorns. Also, this building is a Memorial Hall and it is the ultimate sacrifice of lives that allows us to enjoy the peace and security of communitieslike this school. It is our responsibility to remember and to live our lives to the full. The joy of life is expressed in the little twittering yellow birds. In the beginning, the earth isa dark and formless void. God says, "Let there be light" and, like a lung drawing its first breath, an egg-shaped bubble of light divides the darkness. God sees that it is good, that there is an essential goodness and rightness in creation. God creates the dome of the sky, separating the waters above from the waters below. Light shining through thewater causes a rainbow, a premonition of God's covenant with humanity after the flood. In God's creation there is separation, definition and naming which is how humanity will later seek to understand that same creation. Dry land, earth, is separated from the seas. God commands the earth to bring forth vegetation, seeds, flowers and fruit. Earth is commanded tobe fertile, thus not only do we have separation and naming but we also have interconnectedness where some things do not exist without the support of others. The lights in the heavens are created, the stars and the sun and the moon to separate the night from the day. God commands the waters to bring forth creatures and says, "Let the birds fly above the earth across the dome of the sky". This swirling life bursts from the rim of the earth and everywhere is seen the egg as a symbol of fertility. The beauty and complexity of creation multiplies. The earth is commanded by God to bring forth living creatures of every kind and finally God creates humankind in the image of God. This first man and woman are commanded not to eat of the fruit of the Tree of Knowledge of Good and Evil but, possessed of curiosity and the ability to imagine what might be as opposed to what is, they disobey. In this, humans differ from the rest of creation; we are given the intelligence and skill to explore and even manipulate creation but with this comes the responsibility of making ethical decisions. God creates an expanse in the midst of the water, separating the water above from the water below. 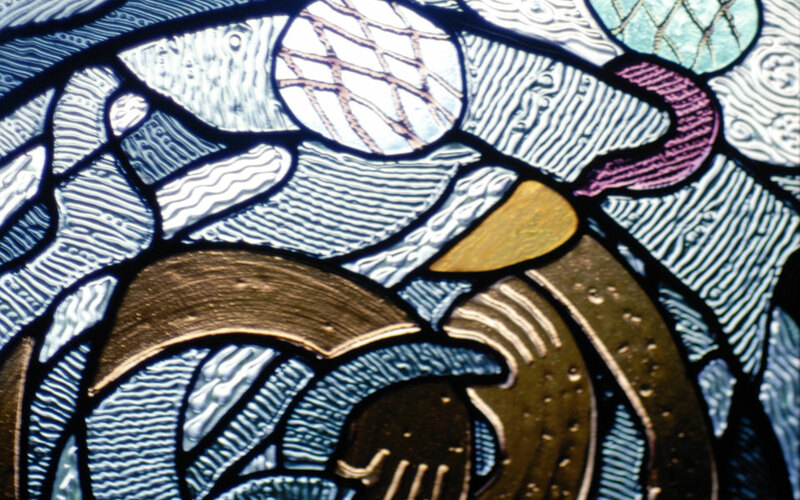 The upper waters and the lower waters are distinguishable by different textures of glass. The upper waters comprise droplets like a heavy shower of rain; the lower waters are made up of shell-like forms. Arching over all the waters is the rainbow – a prevision of the rainbow that will adorn the sky at the conclusion of Noah's flood, the sign that marks the first covenant or promise (brit) between God and humanity. The watery glass extends beyond the frame both above and below, showing that the entire world human experience is bounded by the heavens beyond the firmament: the circle of God's dwelling in the heavens. God creates all creeping things and wild beasts. Humans are made in the image of God and blessed by God to be fruitful and multiply. In the centre of the window man and woman are suspended with a foetus between them. This inner circle of creation is surrounded by other concentric filled with wild beasts, reptiles and insects. The serpent that appears elsewhere encircling the 'Tree of Knowledge' slithers along the side window. Below the serpent, sea creatures break out from the frame as though archaic survivals from an earlier stage in Creation (Day 5). Blessed with intelligence and skill, humanity is bound to be curious about the world and to act upon it. Such gifts cannot ultimately be employed without reference to morality and a sense of rightness. Although human nature is radically different from God's, humanity is capable of approaching God through acts of love, mercy and justice. Regardless of race or creed, all humanity is essentially holy, and dignified by the likeness to the Devine. The festival of Chanukah, (the Hebrew means 'dedication'), celebrates events which took place more than two millennia ago when the Syrian Greeks ruled over Judea and paganised the Temple in Jerusalem. A small group led by the Maccabees expelled the Greeks, restored the Temple and performed a ceremony of rededication. According to later tradition, Chanukah also celebrates a miracle which took place at that time: a single day's supply of oil for the menorah (the sacred candelabrum) lasted eight days. The Chanukah miracle, in the spiritual sense, is a celebration of Jewish survival. Over the eight days of the festival. As successive candles are lit by the 'servant candle' until eight flames are burning, the light of survival grows brighter and brighter. The Chanukah lamp is placed in the window for the world to witness this act of commitment. The Chanukah lamp is decorated with fruit and leaves which hint at its origins as a 'tree of life'. 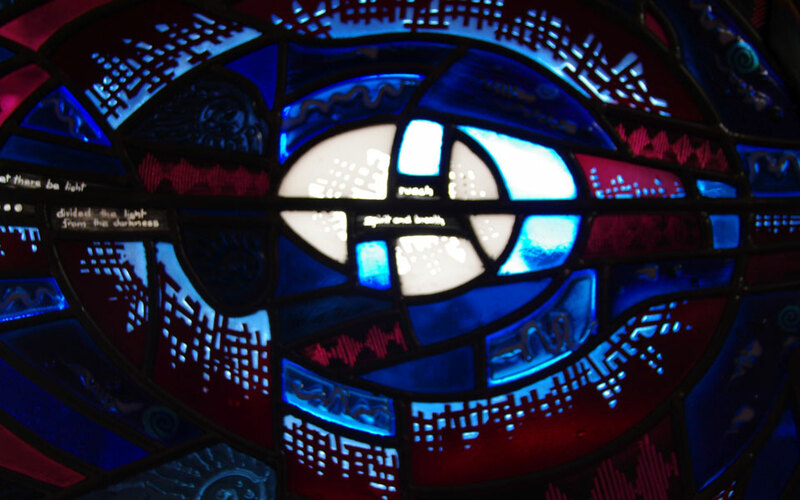 The panel moves from metallic darkness on the right to pale blue glass on the left, alluding to the increase of light that takes place over the eight days of the festival. The flames are shaped as hands which remind us that by our acts that faith is kept alive. Across the sky are inscribed the Hebrew words nes gadol haya sham ('a great miracle happened there'). The first letters of these four words are found on the sides of the spinning top of dreidl, used to entertain the children during Chanukah. This window presents a totally original iconography for the 'Ten Days of Repentance' (aseret y'mey t'shuvah), the period between Rosh Hashanah and Yom Kippur. It draws on the Jacob narrative in the Book of Genesis. About to be reunited with his estranged brother Esau and filled with anxiety and doubt at the prospect, Jacob wrestles with a strange 'man', often identified in Jewish tradition as an angel or divine messenger Jacob's hip is wrenched in the struggle, and the stranger renames him Israel, 'he who struggles with God and with men'. Through this tale, 'God wrestling' becomes the defining characteristic and the destiny of the people of Israel. Overlaying the highly stylised womb-like representation of this struggle between the twin brothers is another story in the Jacob cycle. Twenty years earlier, as Jacob flees Esau's wrath, he dreams of a staircase stretching from earth to heaven. Upon the ladder are angels ascending and descending. These images are pertinent to the Ten Days of Repentance in that our struggles to do right or wrong are embodied in our actions in the real world; our moral dilemmas express themselves through real life responses to the situations in which we find ourselves. In the window, the 'Gates of Repentance' are open to is and the three scrolls of the Book of Life are rolled open before is. We ascend or descend according to our deeds. In this depiction, the ladder has 613 rungs; according to Jewish tradition, this is the number of commandments (mitzvoth) in the Torah, and the mitzvoth are our stairway to the divine. This panel celebrates Sukkot, the Feast of Boots and of Ingathering. By dwelling in a fragile booth (sukkah) over the week of the festival, we are reminded of the Exodus from Egypt and of our ancient ancestors who had no possessions in the wilderness and no houses in which to live. The window shows God's harvest bounty heaped on the table in each sukkah; the stalks of grain, symbolic of life and sustenance, are common motifs in these windows. As in the Shabbat window, the tables are formed from the Hebrew word chai, meaning 'life'. Our lives are a gift from God, and so at Sukkot we give thanks for God's goodness. The whole of the window also forms a sukkah, with its sheltering branches (s'khakh) formed from the metal frame. Across the frame are eight fruit, marking the passage of the moon across the sky during the eight days of the festival. The sun and the moon are both represented, for Sukkot begins at the season of the solar equinox as well as the middle of the Hebrew month Tishri when the moon is full. According to folk tradition, the direction in which the columns of smoke blow indicates the prosperity of the coming year. Since this is the time when prayers for the early (first) rains in Israel are offered, the sky as portrayed in the window is blessed with rain and water is drawn from the earth. Four symbolic species named in the Torah, willow (aravah), myrtle (hadas), palm (lulav) and citron (etrog), are bound together and shaken in anticipation of the rains that come on the winds from all corners of the globe. When we do not mirror God's creative love by treating each other with justice, we risk destroying the bonds that hold human society together. We, both aggressor and victim, may be drawn into the maelstrom of chaos, as much of Jewish experience will attest.Three biblical themes provide the principal imagery for this window: the story of the Tower of Babel, humanity's first attempt to usurp God's dominion; the prophet's image of rapacious beasts seeking to devour human civilisation; and finally, the builders' ladders that are broken segments of the ladder of the mitzvoth in the 'Jacob's Dream' window. The ladders offer opportunities to ascend or descend; the choice is ours. The Tower of Babel represents humanity's will applied to the goal of achieving total power. The Tower seems to emerge outwards from the window towards the spectator. In the devastation that comes from intolerance and hate, symbols of Judaism (the conch-like shofar and tallit) are pushed by the spiral of the Tower into the far corners of the angular window. Fiery red glass expresser the imagery of destruction, with a multitude of hands struggling to emerge from the chaos, seeking wither triumph or reconciliation. 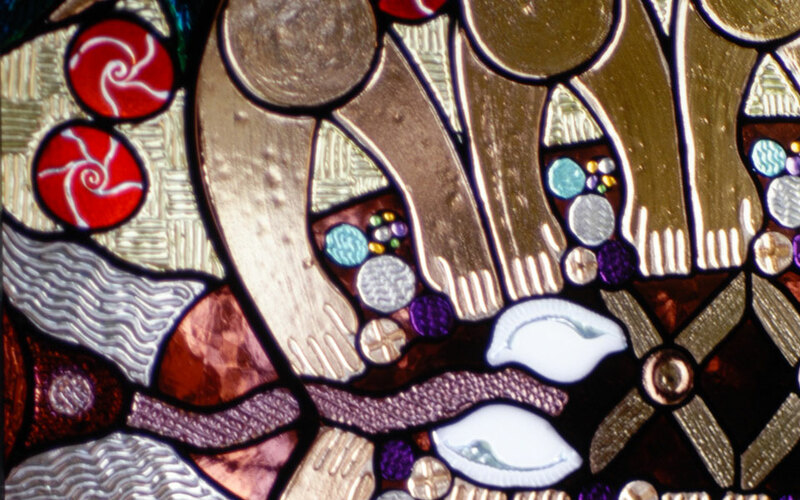 In mirror image of the 'Shavout' window, this window resembles a breastplate with seven bells (rimmonim). The bells are here recast as clappers; or they evoke torn fragments of Torah. The flame at the tip of the plaited candles in the centre of the window symbolises the hope that emerges from devastation. Together with the wine cup and the spice tower, the flame represents the ceremony of Havdalah (separation) that reminds us of God's original act of universal creation through loving generosity (chesed). Our lives are shaped by how we treat each other. Our relationships grow within the golden circle of our love, symbolised in the window and in the Jewish marriage ceremony by the unadorned band of the wedding ring; and they are protected by our actions according to our contract with each other. Similarly, the security of the next generation is bound within the family, just as the seed sprouts and grows in good earth and is nurtured with water. The wedding canopy (chuppah) is symbolic of the bridal chamber, the tent and the roof of the home. It is supported by trees planted at the birth of the couple. In this case the trees are honey-myrtle or banksias, reflecting the adoptive home of the Jewish community in Australia. The intertwining branches and roots in the window echo the intertwined hands of the couple. Blessings for the future are made by a shower of seeds and flowers of fertile plants, and the benedictions to the union are accompanied by two cups of wine. The ceremony often takes place under the stars, as if to echo God's promise to Abraham: may your progeny be as numerous as the stars in the heavens. The more we love, the greater at times is our sorrow. By the breaking of the glass we are reminded that sadness always intermingles with human joy (simcha), and we remember the tragedies always present in Jewish memory, especially the destruction of the Temple in Jerusalem. At the end, we are comforted by the understanding that love endures until the broken fragments are whole again. Birth marks the start of life's outward journey and Cabrini provides support. The waters of the uterus become the river of life. The fire of the Spirit binds the figures with the promise of God's love. Seeds sprout in the earth, triggered by the water. They are a promise of the forests they will become. In partnership, the Cabrini community provides for the whole person, physically, spiritually and emotionally. The medical (shown by anaesthetics, diagnostics, surgery, nursing) and the spiritual (shown by prayer, sacraments, emotional support, respect and dignity) and all the support services (shown by the washing of the feet) are dependent on each other. In each staff member, the Spirit enables and guides. Behind the figures is the burning bush, its thorns are a reminder of Jesus' solidarity with human suffering. Yet the bush is not consumed; it proclaims and celebrates eternal life which gives meaning to both wellness and illness. Death is the consummation of life as we understand it. The community at Cabrini offers skill, love, companionship and dignity through the whole life spectrum. At the end of its life, the tree lays down on the earth and offers itself back to the earth as a gift to the next generation. We are carried from the river of life, accepting that we must ultimately let go, into the sea of another unknown journey. God's promise given in the life and death of his Son, leaps alongside us in our journey over the shore. The flame of the Spirit offers us life everlasting. At the centre of all is the fulfilment of God's promise, through the life, death and resurrection of Jesus. Death is not victorious and at the end of our journey, God through the resurrection of his Son assures us of everlasting life. Our life has been both a tree standing on its own and a foundation upon which other lives are built. The crucifixion offers forgiveness for our frailty. The flames of the Spirit dance triumphantly across the heavens and the crown of the forest burns brightly with flame and flowers. This summer of the forest's beauty turns to autumn and the leaves fall and the burning seeds plunge to earth. Autumn turns to winter and the leaves and branches decay back to the earth, but just as the rainbow arching over the forest and the flame of the Spirit promise life everlasting, so the water of life flows into the earth and the seeds sprout. Spring completes the earth's cycle and God's Covenant with us is made. Challenge in life's journey is represented by the arrival on a strange shore – the forest a seemingly impenetrable wall. Prayer, meditation, reflection and surrender of self provide a way through the forest of doubt, fear and apathy. The vessel is engulfed – symbol of the ultimate frailty of our earthly selves, yet prayer and the guidance of Mary show us the way through the barriers. The new landscape is lit with the fire of the Holy Spirit. Similarly does the migrant build a new life in a strange land. Cabrini welcomes the searcher. The community of believers is unified through the Eucharist. At the head of the window is seen the bread and wine surrounded by the body of Christ – God's people. The trees are symbolic of the Church with their roots in the earth and their branches reaching up to heaven. The earth floats in space, a fragile reminder of our connection with every living thing and of our custody of the planet and its elements – earth, fire, air and water. In the Eucharist we give thanks for all these things and we are sustained in our journey, through Jesus, the gift of God's love. Mary, star of the sea and the Christ child embody love and nurture, each for the other. In their loving interaction they model this for us. Mary's head is crowned with stars which wind out over the ocean lighting our journey. The window is also symbolic of the journey of St Frances Xavier Cabrini and the Missionary Sisters of the Sacred Heart of Jesus who, guided by the Spirit, leave the comfortable and familiar landscape to be bearers of the love of Christ in the world. The work is also about the migrant journey, leaving the homeland for a new life. The vessel is symbolic of our life on earth, of our physical selves, the body enables the spirit. A nexus is a bond or link, a means of connection. The turtle is such a bridge between the elements of the sea and the earth. The turtle in turn symbolises the Island itself a link between communities and cultures. John Donne said that no man is an island and indeed we are social beings learning most from each other. Just as our lands are separated from each other by sea, so we can be isolated by our differences in a sea of misunderstanding. In this age of the new millennium through travel and communication our technology is shrinking the planet and hopefully the sea of misunderstanding. We can celebrate our differences as first hand and thus learn from each other. We measure our own lives in generations, our grandparents, parents, children and their children and the most important part of meaning in our lives derives from these relationships. Through our Turtle Island experience, the Fijian culture and spirit has much to teach us about community and caring for each other, as we whirl through space in our short existence between the past and the future. 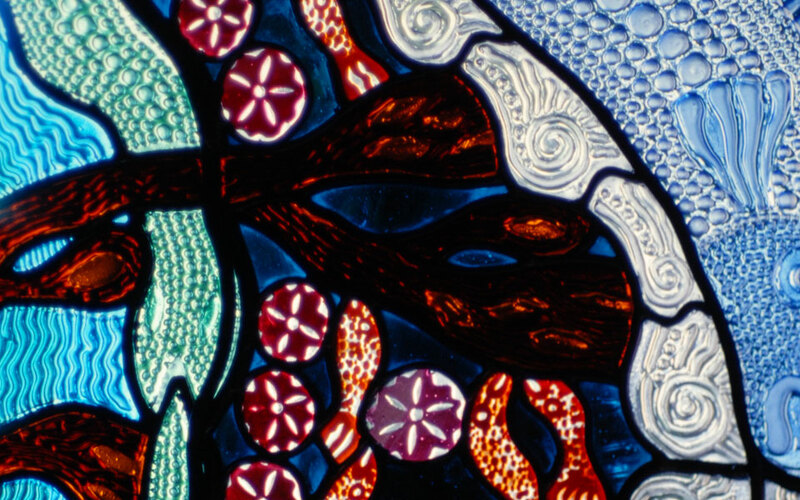 The Millennium Window encapsulated these ideas; the turtle between the sea and the land, the Island within the reef, the planet Earth floating in the sea of stars and space, warmed and lit by the sun, its surrounding seas pulled to and fro by the moon. As we tumble through space our lives oscillate from day to night, light to dark, numbering our hours into days, days into years, years into millennia. We live in an age where we have taken our first steps into this swirling eternal space yet ironically we have learned, looking back, how small and fragile is our Earth. The common link that we share with all those who have lived in the past or will live in the future is the importance of our relationships with one another, our community held together by love and friendship. In the Genesis story of creation the firmament and dry lands are created by the separation of the waters above from the waters below. In this window the dry land is symbolized by the Island, with its paradise beauty. Life is brought forth, starting with plants. The mangrove, such an important species to the Island, links the water, earth and sky. In the heavens the stars and planets, sun and moon are created. The creatures of the water and the air are created, then the creatures that creep and crawl upon the earth. Finally, at its centre is placed humankind, to be custodians of this paradise. The serpent beckons us to eat fruit of the tree of knowledge of good and evil, of all the species it is given us to be knowing and clever but we must ever after make judgements of right and wrong about our actions. The Hindu story of creation sees the universe as an egg broken in half. The bottom half, silver lined, containing the earth and the top, gold lined containing the heavens. The dome of heaven is supported by four turtles and the "double helix" shape represents the interweaving of the forces of creation and destruction, regenerate double nature, just as the sap flows through the tree and the tree sheds its leaves yet is reborn in the spring, just as the snake sheds its skin to be "reborn" in the spring. A Fijian story of creation tells of the serpent who, deserted by his friend the hawk, steals two eggs from the bird's nest and when they hatch, man and woman emerge. The serpent is consoled that he need never again feel lonely. We are indeed one in creation. Genesis tells of a great flood wrought upon the earth when the behavior of the people displease God. Only a select few survive to reach dry land and God sets His rainbow in the sky, a sign of His covenant with humanity. Water is a powerful symbol for both the covering, death, of old ways and the birth or rebirth of the new, just as in baptism we are born again in Christ. In a Hindu story the symbolic flood stands for the end of a formal universe and for the completion of any cycle by the destruction of the power that held its components together. They return to the universal solvent and are reabsorbed into oneness. Each end carries the seeds of a new beginning and there is liberation through the destruction of the world of phenomena. Fijian flood stories include one where the banyan tree is carried away in the flood. When it comes to rest there is so much earth clinging to its roots that it formed an island, took root and became a refuge for people. The tree is also and important recurring symbol. The tree often appears in dreams at critical points in an individuals' lifetime when there is a pressing need for a supporting image of growth and integration. When Richard Evanson helped by Joe Naisali, first came to Turtle Island, there was a destructive and terrifying cyclone. Although the banyan (baka) tree was uprooted they clung desperately to its roots, the start of a bond of friendship which lasts to this day, just as the baka itself survives and continues to spread its protective branches over the Turtle Island family. For Richard the time was one of spiritual growth, integration and commitment. In the window the tabua (whale's tooth) symbolises God's gift of the Island to Richard and the gift of Joe and Richard's friendship. The Hindus regard the banyan tree as the cosmic tree with its root in heaven and its branches reaching down to earth. The cosmic tree not only embodies the unity and diversity of the cosmos but expresses both ascent and expansion. Woven in amongst the roots of the baka is the elephant headed Lord Ganesha, with his single tusk. Hindus turn to him for good fortune in their endeavours. Many people come to Turtle Island to be married or to renew their vows. In this window the Island is seen with its fourteen beaches forming a golden ring like a wedding band. God is a God of love and gives His blessing on this union of man and woman, this marriage. The Hindus say that within this golden ring lies truth and truth is love. The couple are poled along on the billy billy, seated under a canopy garlanded with palm leaves and flowers, while the troche shell is trumpeted. Traditional gifts of tabua are stretched above and below and the seven flames of The Spirit burn for them reminding us of the Seven Virtues, faith, hope, love, prudence, justice temperance and fortitude. For the Fijians, fire is also the symbol of life and for the Hindus the fire is the sacred Agni, symbol of sun and power whose flames represent the life, purity, and power of God and which must be circled seven times. Red is the colour of life. Rice is thrown to ensure the prosperity and fertility of the union and, surrounded by their Turtle Island family, the couple drink a blessing to each other and to their future. This window speaks of out lives from our birth to our passing. Psalm 92 says "The righteous shall flourish like the palm tree". As Joe Naisali explains, the coconut is like the child, with its eyes and mouth. It falls to the earth and under the protection of its parent it takes root. The older tree shades the younger so that it grows straight and strong, to take over when the parent tree is old and dies. So the cycle of life goes on. For the Island, the coconut palm is indeed the tree of life, and the design shows the River of Life flowing from its roots, just as the water of life is symbolized by the Kava Ceremony. A Fijian custom is to bury the umbilical cord under a coconut palm to impart the qualities of this extraordinary tree to the child. It is not surprising that to the Hindus too, the coconut is a symbol of good luck. This window is also about the birth, life and death of Christ, with His Crucifixion symbolized by the cross formed at the center of the design. The blood and water flow from Christ's five wounds. His sacrifice is for us and our salvation. He is laid out in the tomb and is wept over by the women who wait at the entrance of the tomb. At the centre of the design is the Hindu sacred sign for God, OM. Shiva, Lord of the Dance, of life and death is surrounded by a ring of flames. The water of the river Ganges flows from is hair, at his throat is the distinctive blue mark and coiled around him is the cobra. He holds the trident, symbol of his power. Symbolic of the community of all people is the shared meal. On Turtle Island the meal under the baka tree is the focus for guests from all over the world to come together, sharing in the wonderful hospitality that is the Fijian way, to hear each other's stories and to become forever one of the Turtle Island Family. This window is also about the Lord's Supper. Through the partaking of Christ's blood and body we are one body on the family of the church. Just as Jesus extends His arms in protection around His disciples at the Last Supper, so He offers us His love through His sacrifice for us. At the end of the Hindu service we have the Prasad where all share in the fruit and nuts and drink, giving thanks for our oneness in humanity. In the Kava Ceremony we are invited into the Fijian community as we pass around the bilo. Together with the ever present beautiful singing and laughter and stories of the Fijian people we are bound together by the Kava ceremony and made to feel welcome. We learn of the valued Fijian qualities of vakatuvaga, a personality befitting the presence of a chief; veivukei, offering a helpful hand; veinanumi, being lovely and friendly with one another; duavata, togetherness and yalovata, being of the same spirit. By the sharing of food and drink, in various ways we express our common humanity, our thanksgiving for life and for friends both old and new. In this window the Island is shown as a turtle. At its head is the will of God, The Father. At its enter is Jesus Christ, the Son, whose cross is formed by the Water of Life. Through His death we are given new life, rebirth. At the turtle's tail is God the Spirit. The body of the turtle is formed by the community and just as the turtles flippers reach out to the four corners of the earth so the community welcomes people form all over the world, offering friendship, rest and sustenance. The turtle-island straddles between the waters, the earth and the sky. In the four faces pointing to the four corners of the earth, Hindus will see Brahma, the Creator. The window is about other legacies, gifts to the future, which Richard Evanson and the staff are creating on Turtle Island. There is the legacy of the restoration and protection of the ecology of the Island, symbolised in this design by seeds and flowers of some of the many trees planted for the future. The water crossing the Island symbolises the work being done towards self sufficiency. The care for the Island's creatures is shown by the baby turtles emerging from their egg-shells, the cycle of the next generation. The welcoming figures reaching out to take the hands of guests arriving from all points of the compass speak of the Island's gift of friendship, hospitality and community that is its greatest legacy. Finally, in the lagoon is located the mana, the power of effect, the magic that permeates this beautiful piece of paradise, this Turtle Island.